So imagine this, your friend who lives in a one bedroom apartment in the city with three cats invites you over for dinner. And rather than the welcoming allure of baked bread and savory grilled meats, you smell …. well, you smell cats. What is running in your head are a million and half disgusting thoughts, none of which are appetizing. Do not let this happen to you! Don’t. If you have cats, especially more than one cat, you owe it to yourself, your neighbors, your friends and your kitties to have a clean fresh smelling home. Lucky for you, Purina recognizes too that there is no room for stinky kitty smells. 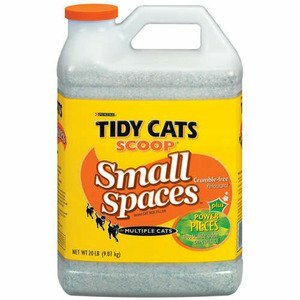 Tidy Cats Scoop Small Spaces is a premium litter that should be top of your list if you have multiple cats and live in a small space. It works. It is a premium litter at $8.79 for a 14lb container; I figure that is 3 weeks of litter. Cost aside, the litter smells great. There is no dust. The litter conveniently clumps upon pee contact. It’s a no brainer. Tidy Cats Scoop Small Spaces can be found in any major grocery store or at Petco.